Resizing images is a routine step during the photo editing process. The size of all photos is often reduced in order to make a picture better suited for use on social media. On the other hand, enlarging a photo can be more complicated than it sounds. Increasing the overall number of pixels in a photo can easily cause pixelization, especially if the original photo was in low resolution. Blurriness, JPEG compression artifacts or image noise are also among frequent unwanted side effects of blowing up digital images. Choosing the right software can help you avoid the potential dangers of enlarging images, which is the reason why we are going to take you through some of the best online as well as Mac and PC-based image enlargers. With the Magnify effects in FilmoraPro video editing software for pros, you can magnify any objects in video without losing quality. Just drag the magnify effect to the video clip in the timeline and adjust its shapes, radius, bulge, wrap, and blending mode per your need. The newly released FilmoraPro empower you the ability to create anything you can imagine with easy professional tools. The resolution of an image determines how much that image can be enlarged without losing any quality. For instance, if the photo’s resolution is 600x400 pixels, trying to increase it up to 4000x3000 pixels can cause blurriness or pixelization. Let’s have a look at some of the best online tools for enlarging low-resolution photos, without compromising their quality. The largest resolution of a photo you can upload to PhotoEnlarger is limited to 1920X1080 pixels, which makes this tool perfectly suited for blowing up images that are relatively small in size. In order to import a photo, you can click on the Browse icon and navigate to the folder on your computer where the picture is stored or you can simply drag and drop the file to the Select Image to Enlarge area of the tool’s page. The Scale value is going to be set to 200% by default, which means that your image is going to be doubled in size, and the PhotoEnlarger platform lets make your photo up to four times larger than the original. After selecting the Scale value or inserting new values into the Width and Height boxes you just have to click on the Enlarge button and wait for the picture to be enlarged. The four versions of the picture in different sizes are going to be generated you can crop each of them and download them. The largest file size you can upload to ImageEnlarger is limited to 6MB, while the maximum resolution is 4100X4100 pixels. The platform offers support for jpg, gif, png, and bmp file formats and it lets you choose between jpg and bmp output formats. You can either upload a picture from your computer by clicking on the Choose a File button or use a URL of an image stored online. The maximum Height and Weight values of the enlarged photo produced with this online tool cannot exceed 4500 pixels. 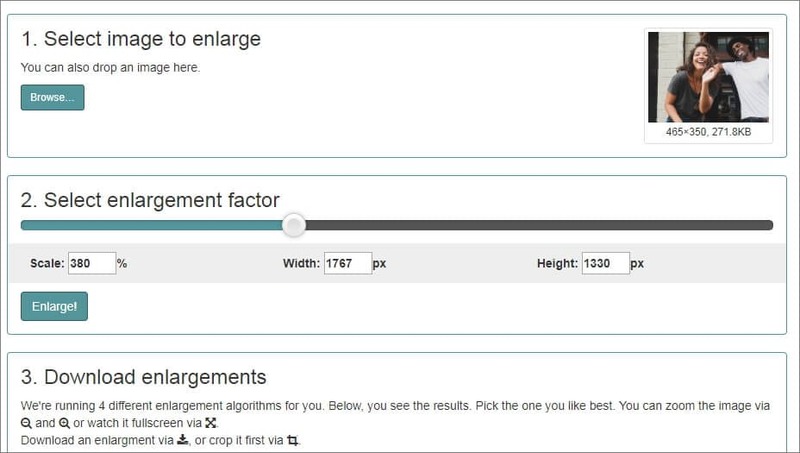 The Zoom Factor option lets you choose how enlarged the photo is going to be and Target Width and Target Height values enable you to change the resolution of the image you’re enlarging. Click on the Start button to process the picture, and then choose the variation of the picture created with different filters you like the most. Simply click on a version of a photo to save it to your computer. Besides offering the basic tools like rotate and crop images, the ResizeImage platform enables you to increase or decrease the size of your pictures. The crop option can be useful if you want to enlarge only a small portion of a photo. In the Resize Your Image section of the webpage you’ll be able to spot a Scale slider, but its value can’t exceed 100%, which means that you can’t use it to enlarge images. Make sure that the Keep Aspect Ratio checkbox is selected to avoid distorting the picture, and then proceed to increase the values in the Width and Height boxes. If the original file had a width value of 1200 pixels you can double it to 2400 pixels without any risk of quality loss. The height value will be adjusted automatically if the Keep Aspect Ratio option is enabled. The new size of the photo will be displayed at the bottom of the screen. Directly above it is the Resize button, click on it and then click on the Download Image button to save a photo to a hard drive. This simple online image enlarger is based on a Deep Convolutional Neural Network and it can also produce the Anime style art. You can import an image by either copying its URL or by clicking on the Choose a File button. After you upload a photo you can choose between Artwork and Photo styles, select the Photo option and set a new level of Noise Reduction. When done, pick the Upscaling option that best fits the picture you’re enlarging and then click on the Convert icon to complete the process. 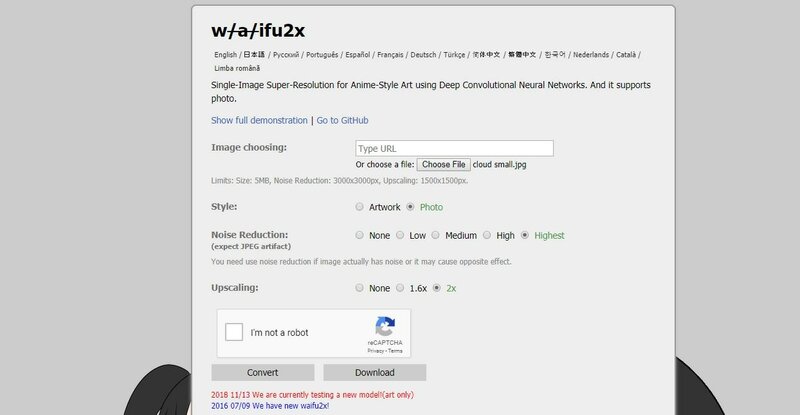 Even though Waifu2x lets its users upscale images effortlessly, its tools are rudimentary. Using a more powerful photo editor will grant you more control over the photo enlargement process. Nearly all modern photo editors offer a plethora of ways to increase or decrease the size of a photo, and they allow you to have much more freedom while enlarging a photo, than online-based solutions. Let’s have a look at some of the best image enlargers for Mac and PC computers. Blowing up a photo with Reshade Image Resizer is quick and easy because you can easily enlarge any photo and preview the results before saving it. The software can be downloaded for free, and you can use it to batch process a large number of images or enlarge a single picture. The photo editing tools the Reshade Image Resizer features enable you to crop a photo, select the resolution of the output photo or the area of the original picture that is going to be enlarged. The software also features a number of options that let you reduce distortions that occur as a result of upscaling. Besides enlarging images this software can also be helpful for lens and perspective correction or image rotation. Additionally, A Sharper Scaling lets you zoom in on a detail of a photo and enlarge it while maintaining a solid level of sharpness in the image. You can choose from a number of interpolation options that make the resized images smoother and less pixelated. The bulk processing option is available as well, so you can blow up hundreds of photos at the same time. The maximum file size cannot exceed 50MB, which is more than enough to ensure the high quality of all images you enlarge with this software. Reducing the size of an image or increasing it, is simple because the software uses algorithms that automatically analyze the picture and help the program produce stunning interpolation results. For instance, The Smart Resize Algorithm can enlarge a photo up to 1000% of the original size while maintaining a relatively high image quality. 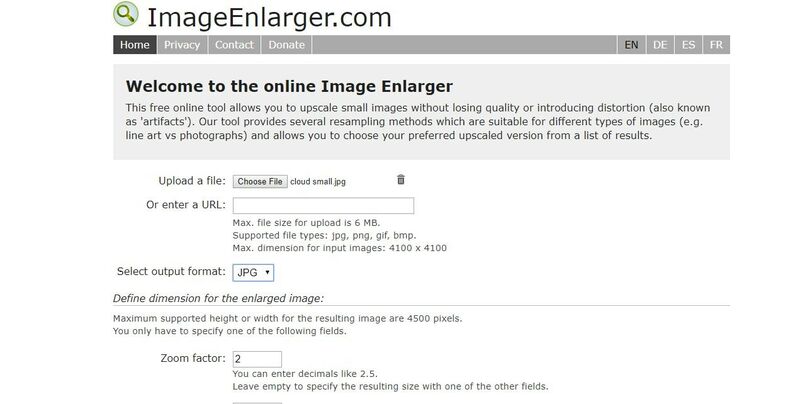 This image enlarger is equipped with batch processing tools, so its users can upscale or downscale large numbers of images in a short period of time. Stoik Smart Resizer is mobile friendly and it can be used to enlarge pictures taken with a Smartphone, a feature that is quite useful if you want to print your photos. JPEG compression artifacts and noise can often ruin an enlarged picture, and for that reason, this software offers a number of powerful tools that effectively remove these distortions and improve the quality of upscaled photos. The software lets you create files that can have more than 50MB and its highly praised S-Spline Max image resize technology is designed to preserve sharpness and details of the objects in enlarged pictures. You can choose from a huge number of presets that can be manually adjusted or create your own preset resize method you can use whenever you’re enlarging photos. PhotoZoom Pro 7 is a powerful image enlarger that makes resizing social media content a fun process. Preparing print materials or simply making your digital images larger is what Fotophire Photo Maximizer does best since it can enlarge photos up to 1000% of their original size. In the software’s Batch Mode you can upscale a thousand images with a single command. The Denoise tool enables you to reduce blur and pixelation with just a click, while the Improved Edges feature helps you preserve clarity when you enlarge a picture significantly. Fotophire Photo Maximizer lets you save your own presets so you don’t have to go through the same process every time you want to enlarge a photo. The software also provides basic Color Correction tools, that can help you make the colors in the enlarged photo more vivid. This Adobe Photoshop and Adobe Lightroom plugin is designed to help professional photographers and digital printmakers to enlarge their images. Unfortunately, you can’t use BlowUp as a standalone software, which makes it a great choice only for Mac and PC users who already have Adobe’s photo editing programs installed on their computers. The plugin offers a number of ways to keep edges sharp without introducing JPEG compression artifacts and it features a number of presets that allow you to quickly adjust the size of the picture to the format in which you want to print it. The best part is that Blow Up can handle images in CMYK mode that is used in offset printing. Adobe Photoshop became famous for its versatility because it is hard to think of a photo editing option this software doesn’t feature. Changing the size of a photo in the Adobe’s highly praised photo editor is a simple task since you just have to go to the Image drop-down menu, and select the Image Size option. Once the Image Size window pops up on your screen you just have to adjust the Pixel Dimensions or Document Size values. Adobe Photoshop also features a number of interpolation presets, such as Nearest Neighbor, or Bicubic Smoother that keep the enlarged images sharps and prevent pixelization. Upscaling images can have disastrous effects if it is not done properly since you can ruin a picture by increasing its size too much. The results of the photo enlargement process often depend on the quality of the online platform or the software that is used to blow up an image. Do you often resize images? Leave a comment and let us know what is your favorite method of enlarging photos.